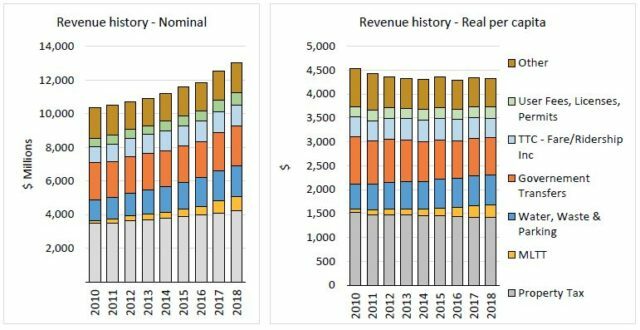 As his parting gift to Toronto Council, City Manager Peter Wallace spells out the effect of years of promised new services and infrastructure unmatched by revenue to build and operate our dream city. Photo courtesy of Dave Bremner via the Torontoist Flickr Pool. Toronto Council is good at making promises, voting for better services, new transit lines, a revitalized expressway, but too many of these promises depend on money the city does not have. At budget time, city staff work their magic and trim spending to fit the available dollars. Programs are stretched to make do with less funding even in the face of growing demand, and bold moves supported by Council simply never make the cut. Capital projects, the big-ticket work of building and rebuilding the city’s infrastructure scrape by thanks to a mix of special taxes, the occasional generosity of senior governments, and the simple expedient of labelling needed work as “unfunded” and hoping for the best in years to come. In financial updates, City Manager Peter Wallace warned repeatedly that Toronto’s aspirations were out of step with its ability to pay, and that many years of budget restraint leave the city with an unsustainable future if policies do not change. This is not a small tweak, a redoubling of pencil-counting efficiency, but a major shift in how Toronto will plan and pay for its future. Wallace leaves his post at the end of March to become Secretary of the Treasury Board in Ottawa. To some local politicians, this might be good news. 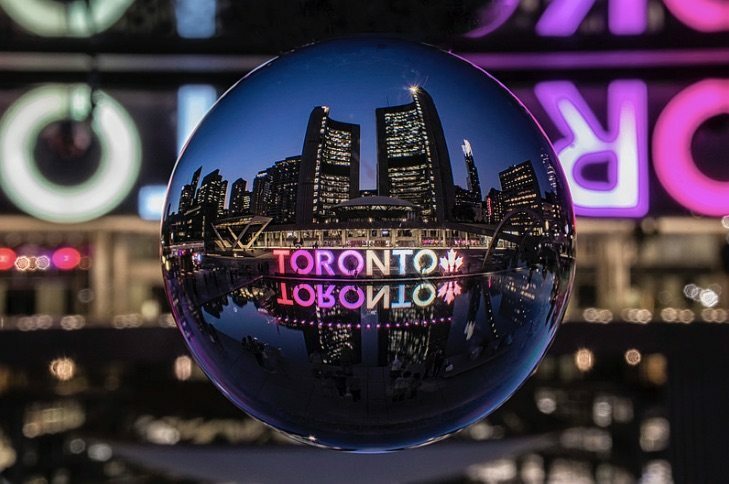 The stern lectures on responsible fiscal planning will end, and Toronto could get a new manager less inclined to doom-filled warnings. That would be a mistake, as Wallace’s long-awaited Long-Term Financial Plan [report and background] so clearly shows. When this plan hits Executive Committee on March 19, Toronto might learn whether Mayor Tory and his colleagues will level with voters and taxpayers about the city’s future. Then again, the committee might simply refer the whole thing to city management and leave any substantive debate for the new post-election council. Toronto Council, and especially the past two Mayors, have one overriding mantra–keep taxes down. The populist rhetoric of our age presumes that government will always waste hard-earned taxpayer dollars, and this sets the stage for policies that give the appearance of restraint, even if, under the covers, this does not always happen. If the budget really were one of heavy austerity, there would be few photo ops for Mayor Tory and the council to trumpet the arrival of some new policy or some new piece of infrastructure, and buying votes with promises would be much more difficult. That is not a path any politician wants to follow, and council fudges its way from year to year getting the numbers to come out right. 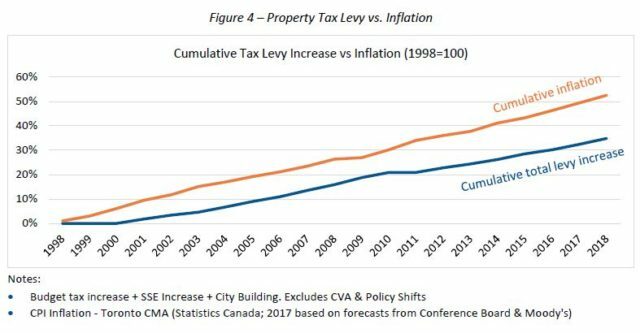 Property taxes are the high-visibility target, and Toronto kept the growth in tax rates below inflationary levels for several years. The starting point for every budget in the Ford and Tory eras is to set a target residential tax increase typically at the rate of inflation. This dictates the size of a large chunk of city revenue. However, commercial taxes do not rise at the same rate thanks to a long-standing program to rebalance the tax load from commercial to residential property, a process that may end in 2020 unless Council stretches out the calendar. Apartment buildings see no tax increase thanks to a provincial directive in 2017. The overall tax rate goes up at less than inflation, and the city loses purchasing power every year. New properties contribute new taxes, but at nowhere near the level needed to offset overall growth. Property values may rise, but tax rates must, by law, go down to compensate, and the city gets no new revenue on that account. Two major parts of the city budget–water and waste management–have their own funding streams from fees that are separate from the tax-based budget, and these fees do not fall under the inflationary guideline. Water rates, in particular, have shot up for many years to fund a much-needed renewal of the water distribution network. Special taxes for the Scarborough Subway (courtesy of Mayor Ford) and for the Capital Building Fund (launched by Mayor Tory) sit on top of the regular tax rate. However, the city’s budget must deal not just with the cost of providing services, but with the increasing demand from a growing population and economy, some of which is beyond the city’s reach for taxation. Keeping the city in the black depends on a variety of factors beyond the basic tax rates. The Municipal Land Transfer Tax is a cash cow for Toronto, with millions rolling through the doors at City Hall year after year thanks to the boom in new construction and the fast increase in house prices. Income from the MLTT is now at $817.7 million, or 6.3% of the total city budget. Without this revenue, property taxes would have to be twenty percent higher to make up the difference. The ability to keep property tax increases low flows directly from the new revenue the MLTT brings in every year. If the property market stagnates, the city must quickly find new revenues or cut its expenses to fit. 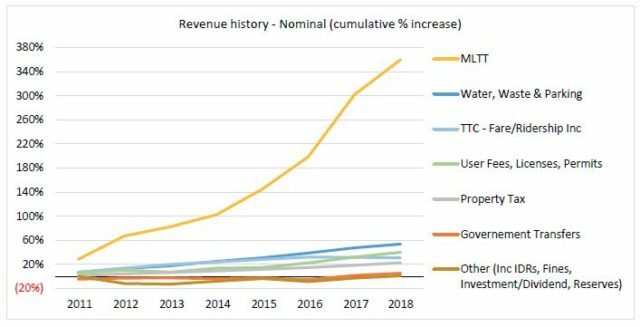 MLTT is by far the fastest growing part of the city’s revenue. The charts below put this growth into context for the overall budget. MLTT is the light orange band which, although small, has widened over the years. The chart on the left is not adjusted for inflation nor for population growth, while the one on the right factors in both of these changes. It may be heartwarming for budget staff to point to the “real per capita” numbers showing city revenue has gone down on that basis, but what voters perceive is closer to the chart on the left where taxes and fees are always rising. This is a difficult political context in which to argue for more city revenue. The real per capita view is notable because it shows how property tax has gone down, per capita, while other factors including the MLTT have gone up. Interest rates and the cost of debt have been low for many years, and the city has borrowed for long periods to lock in these rates. The annual cost, by council policy, should remain below fifteen per cent of city revenues so that most taxes can go to providing services, not to paying down debt. However, big capital projects such as the Gardiner Expressway do not have their own dedicated tax, unlike the Scarborough Subway. This will drive debt costs over the policy line and prevent new projects from starting until borrowing needs drop. As interest rates rise in coming years, new debt will cost more, and less capital spending will be possible while staying within the budget policy. The growth in debt from 2010 to 2018 has been substantial, but the growth in debt service has been much lower reflecting better borrowing terms as old debt is renewed. The level of debt in Figure 9 could not have been sustained without the benefit of lower interest rates. Provincial and federal funding programs come and go, and these will affect future budgets. At the provincial level, the process of uploading some costs from the city ends in 2018. The headroom this created in the budget will not be available in 2019 and beyond. At the federal level, new infrastructure grants aimed at public transit raise the hope of cost sharing on some daunting, expensive projects, but that sharing triggers the need for city spending while the federal money is available, probably sooner than this would have happened otherwise. In the short term, rules regarding the spending period for the Public Transit Infrastructure Fund (PTIF) force money Toronto has received to be spent on work that can be completed quickly. In practice, the lion’s share has gone to fund the replacement of a large number of aging buses in the TTC’s fleet. Although this will produce a benefit of improving reliability because older, cantankerous technology will be retired, this would not necessarily be where the money was spent if not for the need to finish by March 2019 (with a possible one-year extension). In fact, some PTIF money the city originally planned for its own projects could not be spent because of the time limit, and the money was added to the pot available for TTC buses. A similar problem could arise for the second phase of PTIF limiting its ability to fund a long-term project like the Relief Subway. The city and its agencies have a large backlog of capital repairs and improvements that are “unfunded.” This means that they are listed in the budget, but without the revenue needed to pay for them. The two longest and best-known lists are for Toronto Housing Corporation and for the Toronto Transit Commission. In some cases, project delivery schedules are pushed beyond the 10-year window of capital plans so that they have no effect on current budgets, or they simply accumulate “below the line” in an off-budget menu. The TTC has a ten-year capital plan that will require $9.25 billion in funding. This does not include projects with their own dedicated revenue and debt service streams such as the Spadina Subway to Vaughan and the Scarborough Subway. However, there is only $6.5 billion in funding available from city debt (within its target) and commitments from other governments, mainly the federal and provincial gas tax allocation. On top of this, there is a list of projects that are “below the line”, in the sense that they are not even in the unfunded portion of the budget, but are candidates for inclusion if money can be found. There are other anticipated projects that are not even in the “below the line” list. The unfunded list includes all projects identified through TTC’s submission to the City to date. It also includes the City’s transit expansion plan reported to date. The City will be working to establish a prioritization of all unfunded projects on this list, taking into consideration existing SOGR needs as well as City building objectives. When times are good, the city directs money into various reserve funds, rainy day accounts intended to deal with situations where expected revenues don’t materialize or unusual events such as a major storm push recovery costs beyond budgeted levels. However, council has treated these reserves as a way to avoid tax increases slipping in budget additions while only providing one-year funding from a reserve. The Long-Term Financial Plan shows how close to the edge Toronto has sailed in an attempt to limit tax increases. A five-year forecast shows what the city’s operating budget could look like. 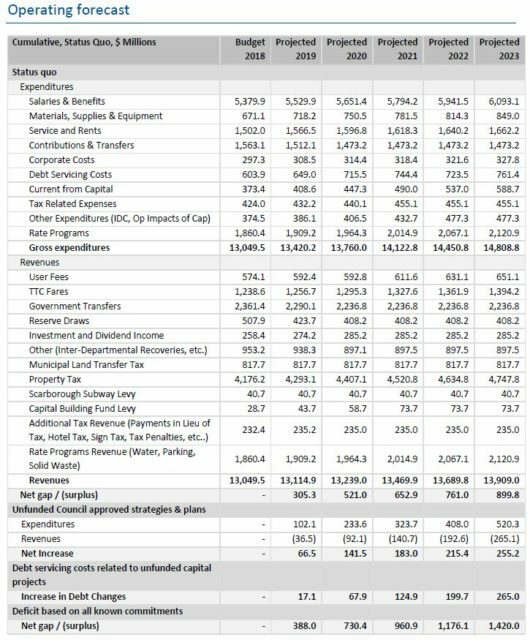 Debt servicing costs will rise by about twenty per cent from 2018 to 2023. The Capital Building Levy is planned to grow until 2021, but this growth will not fully offset the increase in debt costs. A modest increase in TTC fare revenue is expected every year. Any fare freezes or improved concession rates will offset this. Transfers from other governments are expected to decline slightly by 2020, then stay flat. Reserve draws are reduced by twenty per cent by 2020, and then are held flat. MLTT is projected to stay at the 2018 budget level indefinitely. The gap between anticipated revenues and costs sits at $305 million for 2019 and grows to $900 million annually by 2023. This does not include the net cost of programs approved by council but not yet funded that add another $520 million by 2023. This is a very substantial increase in spending, and the city has no strategy to deal with this future. When a new or improved program, service or facility is proposed, the method by which it will be funded should be identified up front. The intent is to avoid a situation where many items are approved “for consideration” in a following budget, but which are not actually implemented for lack of funding. The cost for capital projects should be known reasonably accurately based on design to 30 percent corresponding to “stage gate 3” in the city’s approval process, as should the future operating budget effects of new facilities and services. An incoming Mayor should make a statement of priorities for the coming term that would set the context for budgets to follow. These are all double-edged swords. Council loves to pass motions in favour of good works, but there is no guarantee they will actually occur without political support at the Budget and Executive Committees, which are more conservative than the full council. Some proposals would never make it through a council vote without the certainty that they could be blocked in subsequent budget reviews. Capital projects and cost overruns are a big issue for council, and for that reason they have implemented the stage gate process. A critical step to addressing the disconnect between policy development and financial planning is to know the expected total costs of all strategies and plans, when the money will be needed, options for funding and expected outcomes. All existing and future strategies and plans can be priced, including required expenses and revenues. In theory, this should prevent projects from acquiring significant momentum while they are at the back-of-an-envelope stage, but this implies a level of discipline rarely seen in politicians of any stripe. The current shining example is the Scarborough Subway Extension (SSE) for which a 30 per cent design and cost estimate will not be reported until early 2019. There is little sense among SSE advocates that the plan would be reconsidered, and if the cost goes up, the likely tactic will be to extend the period of the subway levy long enough to pay whatever it takes to get the line built. That’s an easy out, but it means that the tax and borrowing room that the end of the SSE levy could provide will not be available as soon as originally expected. A statement of Mayoral direction has a nice ring to it, but this assumes that an incoming Mayor has any sense of what is practical. Toronto has now seen two Mayors, Ford and Tory, who ran on thinly-researched platforms. Both claimed that expensive transit projects would be self-funding or could find a private sector investor willing to build them. SmartTrack is a prime example where only a rough estimate of the infrastructure cost is known, and that is already the subject of leaks indicating that original estimates were low. There is no information on service levels or operating costs. There is no information on the fare structure beyond vague promises about “TTC fares” without specifying just what they will be. There is no information on the cost of subsidizing free transfers between the TTC and SmartTrack trains. This is a long way from an informed basis on which to implement a mayoral campaign slogan. An important aspect of the political dynamic is that early in a new mayor’s term there is strong support for mayoral policies among those clustered around the office hoping for favours and sinecures. A mayoral statement could become a hard-to-change overriding policy, even if the policy proves to be little more than electoral hot air. Among the decision-making goals advocated by the plan is the need for all agencies to work to a common purpose within the city. That will not be an easy task because the boards of bodies like the TTC, police and other services do not necessarily see their mandates in the same light as council. Indeed, there is a strong argument for such boards to have an advocacy role, to be experts in their field and to present well-informed alternatives to council. By contrast, the TTC board often finds itself debating policies at the most general level without the benefit of a complete view of the organization or of the options they might pursue. If boards and committees are to produce better-informed budgets feeding into a city process, this will require better-informed and involved board members. In turn, this will require better budget projections from staff and real education for board members at budget meetings, not simply a once-over-lightly presentation with a few simplistic questions. Boards do not exist simply to tell management what a wonderful job they have done. Independent boards have a political and practical usefulness to isolate policy decisions from council. However, an agency’s independence can be subverted by policy directions from the Mayor or influential councillors. A major problem with current procedures lies in the early adoption of a target rate of increase in department and agency budgets by council, typically at the Mayor’s direction. Past years saw a directive to flat-line or even reduce expenses across the board. The result was that any move toward advocacy was thwarted by the need simply to keep existing operations going, let alone propose new services. This can be particularly troublesome if advocacy–a simple menu of options for better services–is seen as undermining the official program as happened with former TTC CEO Andy Byford in the early days of the Tory administration. Those were days when the only transit alternative the Mayor cared about was SmartTrack, not better bus service or more attractive fare policies. The city offers a variety of subsidies, deferrals, discounts and rebates that seek to lessen the burden of its many fees and taxes on specific groups of people. These are summarized in a companion to the Long-Term Plan [report and summary table]. These total $473 million annually, although this amount is at least part notional rather than real money that could be recouped by the city. For example, there are a number of TTC fare discounts including free rides for children ($14.5 million), reduced fares for seniors ($24.6 million), students ($28.9 million) and post-secondary students ($15.6 million). Other structural subsidies lie in passes, the two-hour transfer, and even the lowly token which is cheaper than a full cash fare. The full tariff is a balancing act between many considerations. The TTC board froze fares at 2017 levels at a cost of about $30 million in revenue. Add in another $20 million to fund two-hour transfers, not to mention the free ride York Region gets on subway operating costs north of Steeles (about $10 million) and there is a substantial “expense” from the decision to forego revenues. One can argue whether the benefit of each fare subsidy is worth the cost, or whether eliminating the discounts would also reduce or eliminate the riding those discounts induce. To some councillors, anyone who gets a city service at below the standard cost is a freeloader although attitudes differ between subsidies to property owners and industry as opposed to subsidies with a social benefit. At the most general level, council and the Mayor must decide on the city government’s role. Will it be an active participant investing for the betterment of the city, a business-as-usual government happy to just keep the lights on and the wheels turning, or a government that seeks to reduce its presence to basic services? These are shown as illustrations, and it is entirely possible that a mix-and-match approach could be taken to different portfolios with, for example, major investment in infrastructure such as roads and transit, but a stand-pat or minimization approach to social services. Each of these paths has its effect on the financial projection. In the chart below, the solid blue line corresponds to the five-year budget projection requiring $900 million annually in new money. If council does not want to fund anything beyond existing spending (which also implies a real cut in services thanks to inflation), then chart A below applies. 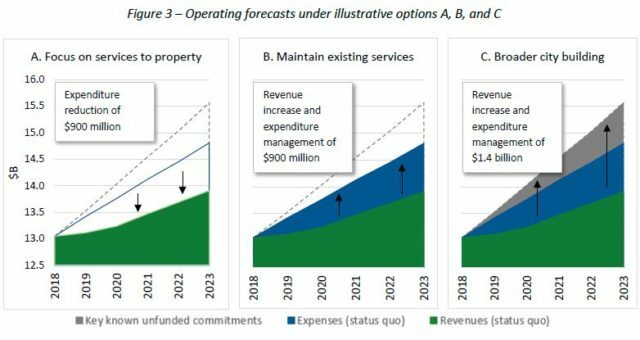 Maintaining existing services requires that new money as shown in chart B, and a “city building” strategy requires council to fully fund all of the programs which it has approved. Note that this does not fund anything beyond the current approvals, and even more money will be required to move some projects into “funded” status. The effect on capital requirements is quite dramatic. Either from its own resources or from substantial contributions from other governments or new taxes, Toronto would have to fund a much higher capital spending level over the next decade. The Long-Term Financial Plan sets out many ways that the city might obtain new revenues, constrain the growth in expenses and direct policies to better integrate planning across its divisions and agencies. Which of these approaches will be attempted is left to the Mayor and council for 2018-22. There is no guarantee that real change will occur until there is a financial crisis so dire it cannot be put over for a future study and endless debate. Will Toronto have the political maturity to acknowledge the past and potential damage of underinvestment in infrastructure and services? Toronto dreams of being a world city, but doesn’t want to pay what this will cost. Easy solutions such as “efficiency” will not free up enough money to pay the bills, while arbitrary limits on taxation will hobble the growth of services without setting a clear policy for city investment. Press conferences and neighbourhood appearances lose their meaning when programs lack funding for want of political support when it is most critical, at budget time.